RWA is proud to announce the release of their most coveted airsoft replica to date; the Nighthawk Custom GRP Recon Steel Burnt Bronze Cerakote Limited Edition Version. 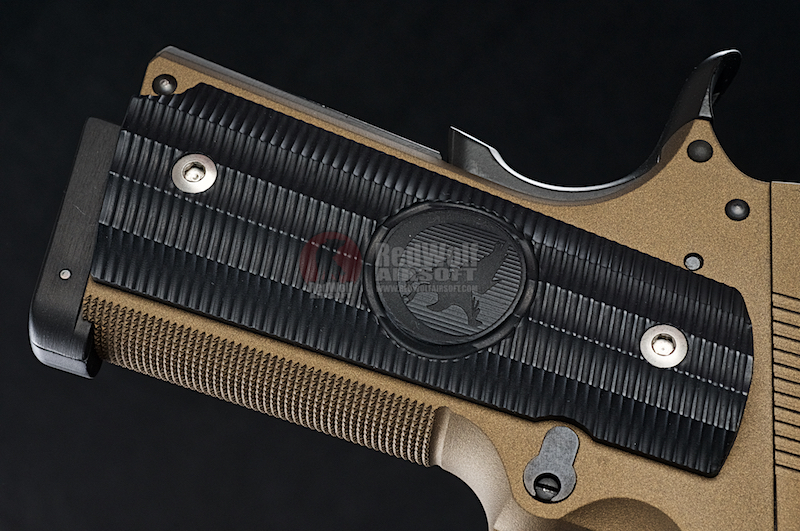 Following the past release of the economical skirmish-focused Nighthawk Custom Recon CO2 pistol, and the collectible Nighthawk Custom GRP Deluxe Aluminium Version and Nighthawk Custom Talon Deluxe Aluminium Version, RWA pushes the envelope further with this new CNC steel offering that combines beauty and performance. In the works for over 18 months to perfect the overall design, exterior fittings, surface texture, color, ergonomics, and shooting performance, this pistol redefines what you can expect from an Airsoft gun. Touted by some who have had an inside glimpse at this new model as the most realistic experience they have had with an airsoft gun, the new pistol impresses from the moment you pick it up. Feeling like it was carved out of one piece of metal thanks to precision CNC steel construction with no shakes, wobbles, or gaps, the performance also delivers impressive range and accuracy. The color, texture, high density checkering on the grips, and the sharply cut switches all closely echo that of the real thing. The new Nighthawk Custom GRP Recon Steel Version truly achieves its mark, and is commensurately desired by customers in Airsoft as real steel operators desire a Nighthawk Custom. 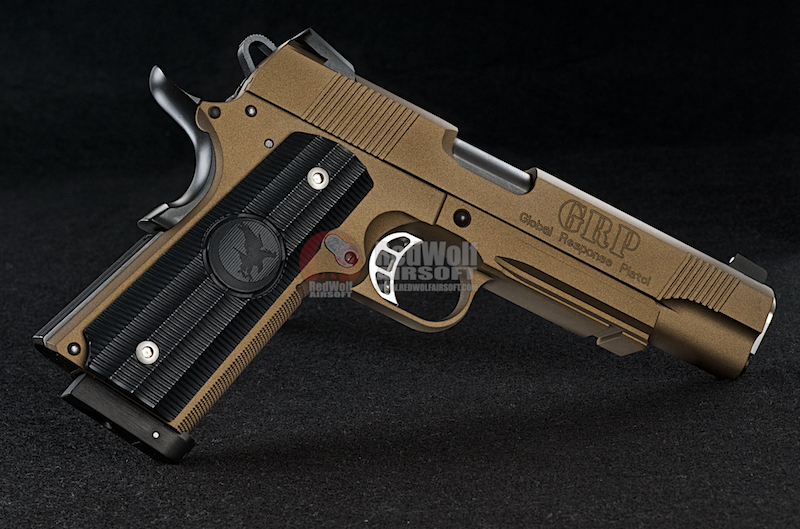 Real Nighthawk Custom GRP pistols retail at over USD 3000 and are considered one of the best 1911?s in the world. The GRP Recon in particular was favored by both Chris Costa and Travis Haley when they served as instructors for Magpul Dynamics. Watch this video as RedWolf TV's Tim takes it to the range. The frame, slide and switches are precision made from CNC steel, while the grips were also carved using a CNC process and hand finished for a unique texture. RWA chose to follow the Marui-based standard, which is arguably the best gas blowback platform by far. Doing so also keeps the gun open to customization options through the large accessory market available for Marui pistols. However, RWA did not borrow any components from Marui. Instead, engineers made numerous modifications to the original design to optimize it for CO2, and to also deal with the greater stress from stiffer springs and much heavier components. Every single component was manufactured from the ground up, choosing steel and other strong materials to ensure reliability throughout the internal mechanism. Despite these changes, the Nighthawk Custom GRP Recon Steel Version is still compatible with Marui single stack magazines, although the performance pales in comparison to using the included CO2 magazine. For those who desire to use Green Gas or Red Gas to run the Nighthawk, changing to a weaker recoil spring would allow increased shots per charge, but there would be a tradeoff in realism. 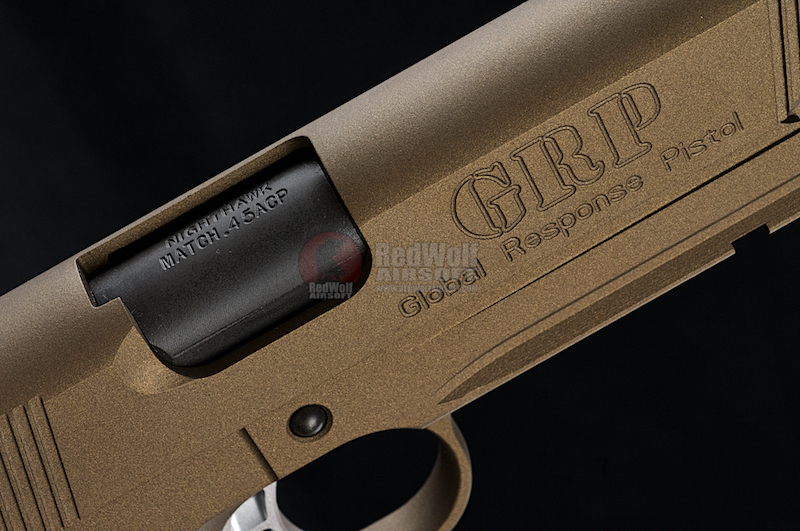 And realism is what the Nighthawk Custom GRP Recon Steel Version is all about. Balancing a stiff recoil and hammer spring for realism against gas efficiency was also a major challenge, and RWA tilted in favor of delivering a more exhilarating and realistic experience. The stiff recoil spring and hammer tells you the GRP means business when you cycle it back. A newly inserted CO2 cartridge is good for approximately 2 full magazines worth of shooting, delivering an average of 340fps+ of power while still cycling in a powerful and snappy fashion. The result surpasses any airsoft gun on the market today. Thanks to the Marui hop-up design, the Nighthawk GRP Recon Steel Version also shoots very straight and far, making it a very practical gun for both target practice and games. However, many of these pistols will likely enjoy more time being presented to friends or simply being adored within it?s beautiful piano wood box than seeing much action on the field. A lot of attention was also paid to the lines of the gun to ensure that the sights are mounted flush atop the slide, and the curving lines continue from the main body of the gun onto the protruding beaver tail. RWA also deliberately engineered the magazine to only drop halfway as opposed to dropping completely out of the gun, which might damage the magazine. The extremely stiff magazine release button also mimics that of its real counterpart and will take getting used to. Much attention was paid to ensure the accessory rail is precisely cut to specification to accept real steel weapons lights snugly. At a loaded weight of 1.2Kg, the RWA Nighthawk Custom GRP Recon Steel Version closely matches that of a loaded real steel Nighthawk Custom GRP Recon. Each piece is individually serial numbered and comes with a certificate of authenticity. All spare parts are readily available for repair and service from RWA. While the Marui green gas magazines will work with this gun, we only recommend you use it in hot weather using RED GAS. The blowback will be very sluggish and you will only be able to shoot around 5-6 rounds. This gun is really designed to be propelled with CO2. You may see the magazines that fit this gun in the Related Products section on the right. Nighthawk Custom is an American firearms company based in Berryville, Arkansas, USA, and was founded in 2003 by experienced gunsmiths who left Wilson Combat to focus exclusively on ultra high precision custom pistols. 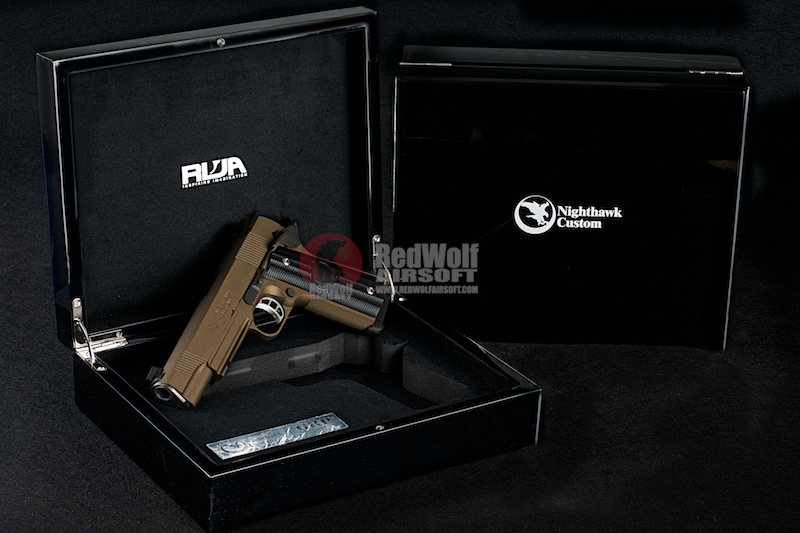 Nighthawk Custom specializes in military, law enforcement, civilian and competition pistols. 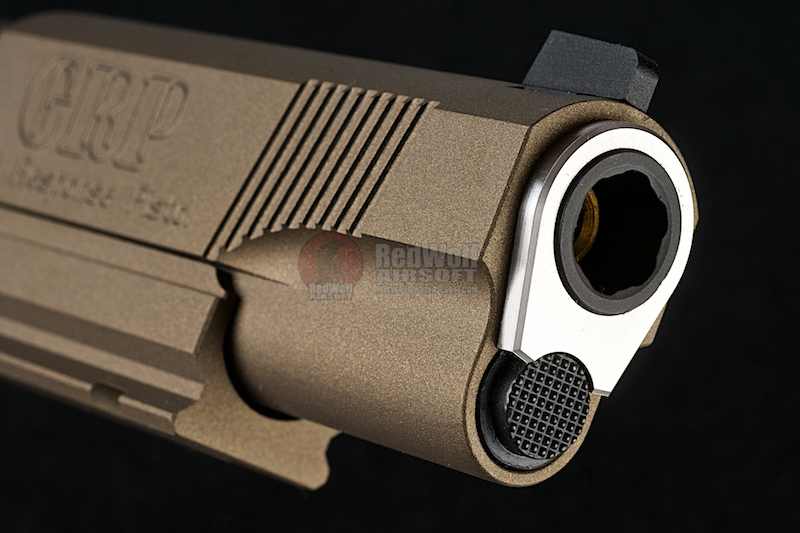 The company has a long standing partnership with Richard Heinie, a respected figure in the M1911 community, in developing premium 1911 pistols. 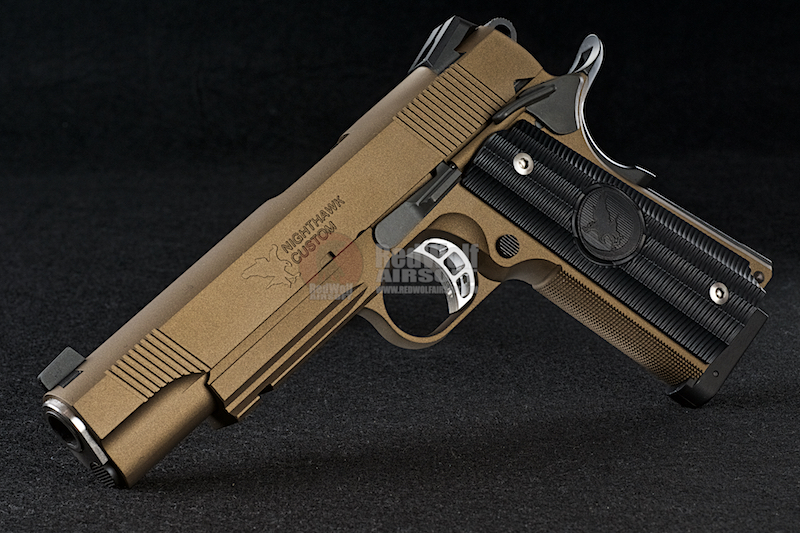 Nighthawk Custom also works with Chris Costa to create a tactical line of pistols. 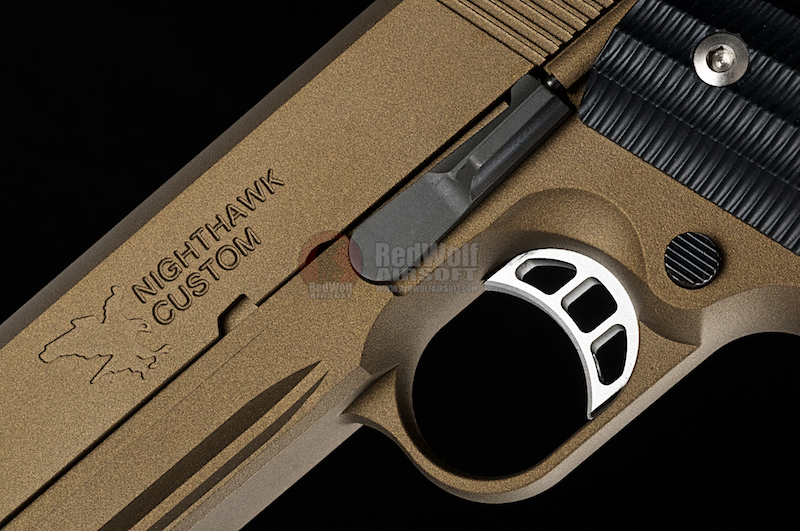 Learn more about Nighthawk Custom at www.nighthawkcustom.com.